Endometriosis is associated with chronic subclinical inflammation. C-reactive protein (CRP), a marker of inflammation, could serve as a biomarker of endometriosis. We tested the hypothesis that a high sensitivity CRP assay (hsCRP) is more accurate than a classical CRP assay in the detection of subclinical inflammation in plasma of women with endometriosis. CRP levels were measured by hsCRP and classical CRP assays in plasma of 204 women with endometriosis and 91 women without endometriosis. Both assays were compared with respect to their value for the diagnosis of endometriosis. The number of plasma samples with detectable CRP was significantly higher (100%) using the hsCRP assay when compared to the classical CRP assay (42.7%) (p < 0.0001). Significantly increased CRP plasma levels were found in women with endometriosis when compared with controls when the hsCRP assay was used in samples obtained during the luteal phase (p = 0.008). The highest discriminative ability for the diagnosis of endometriosis was also obtained using the hsCRP assay during the luteal phase, especially for moderate -severe endometriosis. At a cut-off level of hsCRP > 0.71 mg/L, moderate-severe stages were diagnosed with 80.7% sensitivity and 63.9% specificity during the luteal phase. Using a similar cut-off value for CRP analyzed by the classical method, moderate-severe endometriosis was diagnosed with lower sensitivity (67.7%, p = 0.06) and comparable specificity (63.9%). The hsCRP assay was superior to the classical CRP assay for the detection of low CRP levels and for revealing subclinical inflammation in plasma of women with endometriosis. Endometriosis is defined as the presence of endometrial-like tissue outside the uterine cavity, associated with a chronic, inflammatory reaction. Although the pathogenesis of endometriosis is still controversial, growing evidence indicates a significant role for immunological and inflammatory factors in the development of endometriosis  as demonstrated by increased concentrations of activated macrophages, cytokines, angiogenic factors, T cells and B cells [2–4]. Endometriosis can be considered as an inflammatory disease . C-reactive protein (CRP) is an acute phase protein and a marker of inflammatory reaction, could serve as a potential non-invasive biomarker of endometriosis. Its production is stimulated by pro-inflammatory cytokines such as IL-6, IL-1 and TNF-alpha  which are up-regulated in women with endometriosis when compared to controls [1, 7]. CRP is widely accepted as a biochemical marker of systemic inflammation  and routinely used as a marker of infection, inflammation or tissue damage in clinical practice . Moreover, slightly elevated CRP levels may indicate a low level of chronic inflammatory reaction in patients at risk of developing metabolic syndrome, colon cancer and cardiovascular disease [9, 10]. Published evidence suggested that endometriosis could be viewed as a local disease with systemic subclinical manifestation . Data regarding the CRP level in peripheral blood of endometriosis patients are relatively scarce and controversial [11–14] probably related to differences in study design, patient selection and methodology used to detect CRP levels in peripheral blood. In our study, samples were collected at a well defined phase of the cycle and results were corrected for cycle phase, as recommended by the QUADAS (Quality Assessment of Diagnostic Accuracy Studies) guidelines [15, 16]. Classical automated methods for CRP measurement typically have limited sensitivity in the low range of CRP concentrations in peripheral blood . Several hsCRP assays have been developed with improved sensitivity and precision at low concentrations of CRP with the aim to detect subclinical inflammation . Indeed, a high sensitivity of the assay may be of great importance to detect low grade inflammation in plasma. Therefore, we tested the hypothesis that in plasma a high sensitivity CRP assay (hsCRP assay) is more accurate than a classical CRP assay (classical CRP) to detect low grade inflammation in plasma of women with endometriosis. The development of a reliable and accurate non-invasive diagnosis of endometriosis is one of the hot topics in endometriosis research. A clinically useful, non-invasive diagnostic test would have a groundbreaking impact on the patients' quality of life, on the efficacy of the available treatments as well as on the financial aspects of the disease . The diagnostic accuracy of a test is commonly measured by using a ROC (receiver operating characteristic) curve analysis. When two different tests are compared, results are usually described as one test to be more sensitive or specific than the other. However, such results have only a descriptive character  and it is necessary to analyze statistically the performance (sensitivity and specificity) of both tests, and this analysis can impact medical decision making . In this paper we compared the diagnostic performance of the hsCRP assay and the classical CRP assay to detect low grade inflammation in plasma of women with endometriosis. This study was approved by the Commission for Medical Ethics of the Leuven University Hospitals. Plasma samples were collected for the Endometriosis research Biobank after obtaining written informed consent from women undergoing laparoscopic surgery for subfertility with or without pain at the Leuven University Fertility Centre (LUFC) since 1999. Plasma samples were collected prior to anaesthesia induction in EDTA tubes, centrifuged at 3000 rpm for 10 minutes at 4°C, aliquoted, labelled and stored at -80°C till analysis. The time interval between sample collection and storage in the -80°C freezer was maximum 1 hour. For each patient, relevant information (e.g. date of collection, identification code, clinicopathological data) was entered in the electronic biobank database of the LUFC. The following exclusion criteria were used: samples collected from women who were on hormonal medication at the time of collection, who had been operated within 6 months prior to the time of collection, or who had other pelvic inflammatory disease or general diseases at the time of collection. A total of 295 plasma samples were selected from 204 women with laparoscopic confirmed endometriosis (ASRM stage I-II, n = 135; ASRM stage III-IV, n = 69) and 91 women with laparoscopic excluded endometriosis at the time of laparoscopic surgery for subfertility with or without pain at the LUFC during the menstrual (n = 60), luteal (n = 116) and follicular phase (n = 119) of the cycle (Table 1). A power calculation was not done as this was an exploratory study using plasma samples obtained from our endometriosis research biobank. Most samples included in this study have been used in the previously published study of our group  where we evaluated 6 different potential plasma biomarkers (including hsCRP but not classical CRP) with the aim to develop a diagnostic panel for a non-invasive test for endometriosis. In each sample, the level of CRP was measured twice using 2 different methods: the classical CRP assay (referred to as CRP), using an automated CRPLX Tina-quant C-Reactive Protein (Latex) assay (Roche, Vilvoorde, Belgium) and the high sensitivity CRP assay (referred to as hsCRP), using a (Latex) HS Tina-quant C-Reactive protein (latex) high sensitive assay (Roche, Vilvoorde, Belgium). Both assays are based on the principle of particle-enhanced immunological agglutination and were performed on a Roche Modular P instrument (Roche, Vilvoorde, Belgium) at the central laboratories of the University Hospitals Leuven (Gasthuisberg, Leuven). Briefly, anti-CRP antibodies coupled to latex microparticles react with CRP in the sample to form an antigen/antibody complex leading to agglutination causing turbidity of the reaction mixture, which is proportional to the CRP concentration and measured quantitatively. The lower detection limit of the classical CRP assay and the hsCRP assay was 0.425 mg/L and 0.03 mg/L respectively. The functional sensitivity of the classical CRP assay and the hsCRP assay was 0.88 mg/L and 0.11 mg/L respectively. For hsCRP, the within-run precision was 1.34% CV at 0.55 mg/dl and 0.28% CV at 12.36 mg/dl. Total imprecision was 5.70% CV and 2.51% CV at those concentration levels. For CRP, the within-run precision was 2.5% CV at 5.76 mg/L and 0.76% CV at 150.1 mg/L. Total imprecision was 2.53% CV and 1.8% CV at those concentration levels. Data are presented as median and range. A p value < 0.05 was considered statistically significant. Samples with plasma CRP levels below the detection limit of the assay were included in statistical analysis using the value corresponding with lower detection limit (LLD). Differences in CRP levels in women with and without endometriosis were evaluated using the Mann-Whitney test (endometriosis versus controls) and the Kruskal-Wallis test with post hoc Dunn analysis (minimal-mild endometriosis versus moderate-severe endometriosis versus controls). The ROC curve analysis was performed to determine the diagnostic performance for both the classical CRP assay and the hsCRP assay separately. The area-under-the-curve (AUC) is a relative measure of the diagnostic accuracy and allows comparison of the diagnostic accuracy of different tests . In our study the AUC was calculated and evaluated based on previously published guidelines and definitions [20, 21]. The clinical value of a laboratory test with AUC values between 0 and 0.5, 0.5-0.7, 0.7-0.9, or > 0.9 can be defined as zero, limited, moderate, and high, respectively . The ROC curves were compared by using Analyze-IT software for Microsoft Excel (Analyse-it Software, Ltd; Leeds, United Kingdom). The Mc Nemar test for correlated proportions was used to check differences in sensitivity between hsCRP and CRP tests as described before [19, 22]. The numbers of plasma samples with detectable CRP levels between both assays were compared by using Chi-square test. Correlation analysis was performed by calculating the Spearman coefficient of correlation. The Fisher r to z transformation test was applied to assess the significance of the difference between two Spearman correlation coefficients. Bland-Altman analysis was performed to assess the agreement between two methods. When compared to controls, CRP plasma levels were comparable (p = 0.12) or not-significantly elevated (p = 0.06) in women with endometriosis using either the classical CRP assay or the hsCRP assay, respectively (Table 2). Significantly increased CRP plasma levels were found in women with endometriosis when compared to controls when the hsCRP assay was used in samples obtained during the luteal phase (p = 0.008), but not in samples obtained during follicular or menstrual phase (Table 2). No differences in CRP levels according to cycle phase were observed when the classical CRP assay was used (Table 2). The CRP plasma levels were higher in women with stage III-IV of endometriosis than in women with stage I-II endometriosis or than in controls using either the classical CRP assay (p < 0.0001 or p < 0.0001, respectively) or the hsCRP assay (p < 0.0001 or p < 0.0001, respectively). When compared to controls, increased CRP plasma levels were found in women with stage III-IV of endometriosis using either the classical CRP assay or the hsCRP assay during both the luteal phase (p = 0.0033 or p = 0.0005, respectively) and the follicular phase (p = 0.038 or p = 0.0025, respectively) but not during the menstrual phase (Table 2). ROC curve analysis was performed for the classical CRP assay and the hsCRP assay separately to identify the discriminative power of the tests. Diagnostic performance was calculated at the optimal cut-off value (based on the highest sum of sensitivity and specificity). Table 3 illustrates the data for all stages of endometriosis combined and for minimal-mild and moderate-severe stages separately (overall data for all cycle phases combined and separate data according to phase of the menstrual cycle). Figure 1A-D illustrates the data for moderate-severe endometriosis (overall data for all cycle phases combined and separate data according to phase of the menstrual cycle). The area under the ROC curves (AUC) were compared as described previously . Superior diagnostic performance (higher AUC) was demonstrated for the hsCRP assay when compared to the classical CRP assay (Table 3; Figure 1A-D). 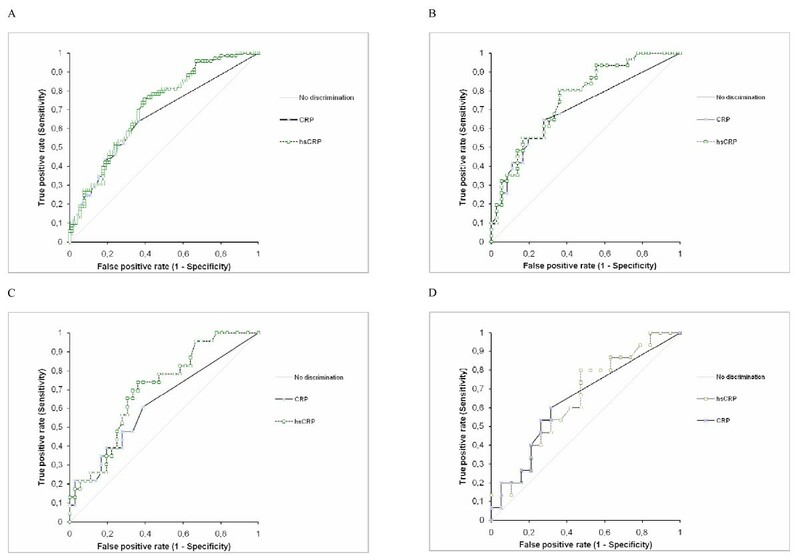 Indeed, the AUC was significantly higher for hsCRP analysis than for classical CRP analysis for the diagnosis of moderate-severe endometriosis in an overall analysis (all cycle phases combined, p = 0.018) and for the diagnosis of minimal-severe endometriosis during the luteal phase of the cycle only (p = 0.037). The highest discriminative ability for the diagnosis of endometriosis was obtained using the hsCRP assay during the luteal phase, especially for moderate -severe endometriosis (AUC 0.76, Table 3; Figure 1B). At a cut-off plasma level of hsCRP > 0.71 mg/L, moderate-severe stages of endometriosis were diagnosed with sensitivity of 80.65% and specificity of 63.89% during the luteal phase of the menstrual cycle. Using a similar cut-off value for CRP analyzed by the classical method during the same luteal phase, moderate-severe endometriosis was diagnosed (AUC 0.7, Table 3; Figure 1B) with lower sensitivity (67.7%) and comparable specificity (63.9%). However these differences in sensitivity were not statistically significant (p = 0.125 (two-tail) or 0.0625 (one-tail)). ROC of hsCRP and CRP for prediction of moderate-severe endometriosis. A: In an overall analysis (all cycle phases combined). The AUC was significantly higher for hsCRP analysis than for classical CRP analysis for the diagnosis of moderate-severe endometriosis in an overall analysis (all cycle phases combined, p = 0.018). B: In a luteal cycle phase. The AUC values of hsCRP and CRP were not significantly different (p = 0.065). C: In a follicular cycle phase. The AUC was higher for hsCRP analysis than for classical CRP analysis with borderline significance (p = 0.047). D: In a menstrual cycle phase. The AUC values of hsCRP and CRP were not significantly different (p = 0.83). Due to comparable plasma CRP and hsCRP levels between women with stage I-II endometriosis and controls (Table 2), the ROC curve analysis was not useful and it was not possible to develop the optimal cut-off point for the diagnosis of stage I-II endometriosis (Table 3). The number of plasma samples with detectable CRP was significantly higher (295/295 or 100%) using the hsCRP assay when compared to the classical CRP assay (126/295 or 42.7%) (p < 0.0001). Comparison of the CRP plasma levels between the classical CRP assay and the hsCRP assay showed a good Spearman correlation coefficient, ranging between 0.74 and 0.997 (Table 4), which was significantly higher (p < 0.001) in the endometriosis group (0.996) than in the control group (0.74). The bias and corresponding limits of agreement between two CRP tests are listed in Table 4. To the best of our knowledge this is the first study which evaluated and compared the diagnostic performance of hsCRP and classical CRP assays in endometriosis based on the comparison of ROC curves and diagnostic sensitivities of these tests, as recommended by previous investigators [19, 24, 25]. In this study we demonstrated that CRP plasma concentrations within the normal reference range (between undetectable and 10 mg/L), as detected by the hsCRP assay, confirm the presence of subclinical inflammation in patients with endometriosis. The concentrations of CRP levels in healthy adults are normally less than 10 mg/L and serum levels of CRP may increase over 1000-fold following inflammation or infection [6, 26, 27]. In clinical practise only the levels of CRP above the reference interval are considered as being of clinical significant . However, CRP concentrations within the normal adult reference range provide valuable information of chronic inflammatory processes like Helicobacter pylori and Chlamydia pneumonia [6, 28] and also endometriosis, as demonstrated in our study. Routine CRP assays often do not quantify CRP concentrations below the upper normal limit that may be relevant to detect subclinical inflammation which may occur early during disease development . Such quantification is possible using high sensitivity CRP assays, based on the principle of particle-enhanced immunological agglutination or enzyme-linked immunosorbent assay . In our study the hsCRP assay was superior to the classical CRP assay for the detection of subclinical inflammation in plasma of endometriosis patients. Our results are in line with the observations of other investigators [29, 31], who provided evidence for an additional value of hsCRP in the clinical assessment of patients with Wegener's Granulomatosis, ankylosing spondylitis and non-radiographic axial spondyloarthritis [29, 31]. These authors reported that hsCRP but not CRP levels, were higher in sera from patients who subsequently relapsed versus those who did not, indicating patients at risk . In the mentioned studies, hsCRP levels were more closely associated with disease activity than CRP levels [29, 31]. In our study, the hsCRP assay was superior to the classical CRP assay with respect to the proportion of plasma samples with detectable levels of CRP (100% versus 43%) and to its diagnostic performance (AUC, ROC curves, sensitivity). The diagnostic performance of hsCRP was superior to the diagnostic performance of classical CRP to distinguish endometriosis from controls (especially stage III-IV during the luteal cycle phase) (Table 3). Indeed the AUC was significantly higher after hsCRP analysis than after classical CRP analysis for the diagnosis of moderate-severe endometriosis in combined analysis (all cycle phases combined) and for minimal-severe endometriosis (during the luteal phase of the cycle only). The optimum cut-off value of plasma CRP > 0.71 mg/L obtained during the luteal phase of the menstrual cycle could predict nearly 13% more patients with moderate-severe endometriosis using the hsCRP assay when compared with the classical CRP assay. This is an interesting observation since our cut-off value (0.71 mg/L) was similar to the lowest cut-off point used in the risk assessment algorithm in the primary prevention of Cardiovascular disease [6, 32]. In that survey, a mild relative risk of future cardiovascular disease was determined using low plasma levels of hsCRP between 0.7 -1.1 mg/L . Although both endometriosis and atherosclerosis are associated with oxidative stress , at present there is no evidence that women with endometriosis have an increased risk for cardiovascular disease and atherosclerosis. Comparable plasma CRP levels between women with endometriosis and controls (Table 2) resulted in a low AUC (0.55, Table 3) demonstrating limited clinical value. Plasma CRP and hsCRP levels were comparable in women with stage I-II of endometriosis and controls (Table 2), resulting in low AUCs (0.50-0.57, Table 3), that did not allow determination of any cut-off points, demonstrating no clinical value. The strength of this study lies in the fact that comparison of the diagnostic performance of hsCRP and CRP assays was evaluated on a large number of patients with laparoscopically confirmed or excluded endometriosis during all phases of the menstrual cycle. The rationale for separating the different phases of the menstrual cycle is justified by the following observations. Firstly, according to QUADAS (Quality Assessment of Diagnostic Accuracy Studies) guidelines [15, 16], samples should be collected at a consistent phase of the cycle and results should be corrected for the cycle phases. Secondly, according to a recently published systematic review, lack of correction for the phase of the menstrual cycle can explain the considerable variability between studies with respect to blood levels of biomarkers in women with endometriosis and controls . For instance, such correction was absent in three of the nine reviewed papers investigating IL-6 as a biomarker for endometriosis, despite evidence that levels are known to change throughout the cycle [15, 34]. Thirdly, CRP levels in peripheral blood have been reported to be significantly higher during the midcycle and luteal phase when compared to the follicular phase . Comparison of our results with those from other studies reporting CRP levels in women with endometriosis is difficult (Table 5) due to differences in patient phenotype, patient number, type of peripheral blood (serum or plasma) and CRP methodology (variety of assays manufactured by a variety of companies) [11–14, 36]. The sensitivity of the CRP assay is crucial for measurements of analytes with low concentrations. However, using a hsCRP assay, no differences were found in serum CRP levels between women with and without endometriosis in 2 studies [12, 13], including a much smaller number of patients (n = 38 and n = 82, respectively) than in our study. The high correlation between hsCRP and classical CRP assays observed in our study (Table 4) confirms data reported before . In conclusion, the hsCRP assay was superior to the classical CRP assay for the detection of low CRP levels indicating subclinical inflammation in plasma of endometriosis patients. Diagnostic performance of hsCRP was superior to classical CRP in women with moderate-severe endometriosis. However, CRP is not useful for diagnosis of early stages of endometriosis. Study concept and design: AV, CMK, XB, TD; Acquisition of data: AV, CMK, XB, CM, KP, CT, TD; Analysis and interpretation of data: AV, XB, CMK, AF, TD; Drafting of the manuscript: AV, XB, AF, TD; Critical revision of the manuscript for important intellectual content: AV, XB, AF, CMK, CM, KP, CT, TD. Prof. TM D'Hooghe had full access to all the data in the study and had final responsibility for the decision to submit for publication. All authors read and approved the final manuscript.